The third episode of my D&D 4th Edition game is done. In this adventure, the party is waylaid by illusions emanating from a mysterious tower occupied by a deceitful gnomish wizard. This adventure is designed for four 3rd-level characters, and should provide them with half of a level’s experience, or take them to fourth level if you double experience as I do. Note that because I double experience, this adventure contains a full level’s worth of treasure. GMs using this adventure will want to adjust accordingly. The full adventure is after the break. In Episode 5, I discussed the difference between short form and long form video games and interactive fiction. I compared certain games to short stories and novels, but I didn’t discuss the third well-known form of artistic writing: poetry. A poem is a work of language where the properties of the language itself — rhythm, sound, and imagery — are as important (or more important) than the words’ literal meaning and the narrative content of the work. When I think of “poetic” games, where the form is as important as the content, I think of Tetris. Tetris is a game with a very simple narrative: pieces are falling, and must be organized or else the game ends. The story isn’t very important. What stands out about Tetris is its feeling and gameplay: the imagery and form of the game. The excitement of the race against time, the satisfaction of clearing a row, and the imagery of building a wall and tearing one down, where any hole is a flaw. 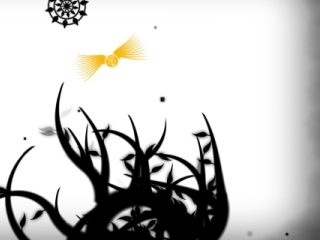 “Phyta,” by Abraham Parangi, is a poetic game. Difficulty and completeness: Why do games have to be hard, and how is finishing a game separate from completing it? The music for this episode is “Big Bad World One” by Jonathan Coulton, and is available under a cc by-nc-sa 2.5 license. This episode, unlike most, is available under a cc by-nc-sa 2.5 license. The next episode will be about the length of games and how that relates to game classification. Is there a distinction between an interactive “short story” and an interactive “novel”? If you have comments or ideas, contact me at gregory@ludusnovus.net. Variable player experience: What do we mean by interaction, and how can two players have different experiences with the same work? The music for this episode is Enrique Granados’s “Spanish Dance n. 2” performed by Mario Mattioli, and is available under a cc by-nc 2.5 license. This is the first episode in which I’ve talked much about table-top roleplaying games. Hamlet on the Holodeck by Janet H. Murray. I made a series of notes as I played the games in Introcomp 2006, so that I could score them appropriately. They’re after the break. Keep in mind that these are just running notes, so sometimes they’re grumpy and sometimes they’re wrong. I’ve added a final thought to each one in italics. The unreliable narrator: how do you use this technique when the narrator is usually the player character? The music for this episode is “Noite de Carnaval” by Code, and is available under a cc by-nc 2.5 license. I will be out of town for a week, so the next full episode should appear on August 19, 2006. There may be something put up between now and then, though.